When you are listening to the Track Officals, you hear the same thing that the drivers hear. Line ups, green flags, warning or cautions, you'll hear it all. Now you don't have to miss another PA announcement due to the noisy track or crowd. 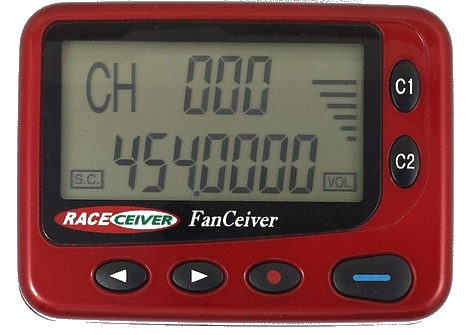 Like every other RACEceiver, there are 1600 UHF channels between 450 & 470 Mhz preprogrammed in the FanCeiver. 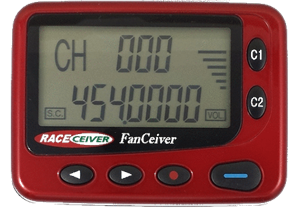 So you can take your FanCeiver to any racing event and listen to your favorite drivers...YES, even the NASCAR races. Since both the channel number and frequency are on the display, all you need is a frequency list. The RACEceiver FanCeiver comes with a earbud, holster, battery and instructions to get you started. Optional headphones are available. We recommend the headphones for noisy enviornments.